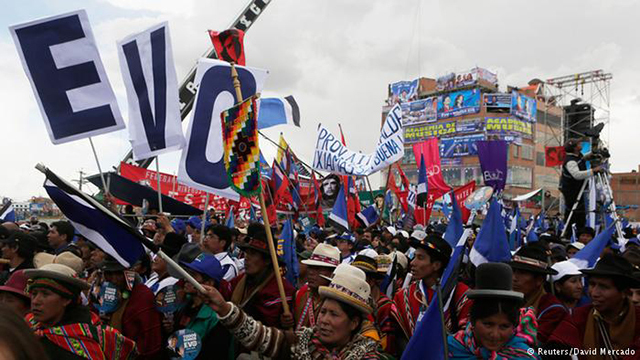 Bolivia Elects Morales for Another 5 Years: Is Revolutionary Change Still on the Agenda? On Sunday, October 12, Bolivians voted to re-elect Evo Morales Ayma, Bolivia’s incumbent president, with an overwhelming 60% of the vote. Morales has indeed gained widespread popular support through his anti-imperialist and socialist policies, with even the World Bank forced to recognise the successes of his social programmes. His government has fallen short, however, of the revolutionary promises it was first elected on. That is why it is important to ask: how far do Morales’ reforms truly go? Morales’ widespread popularity stems from his poor and indigenous background, and his symbolic role in the anti-imperialist and anti-neoliberal popular uprisings of the 2000s. He first became known for leading the coca farmer’s fight against the War on Drugs driven by the U.S.A. to criminalise the coca leaf, a sacred plant in Bolivia, legally used daily by hundreds of thousands of Bolivians. He then took an active part in the social revolutions that brought people to the streets in mass numbers to protest the privatisation of water in 2000 and to call for the nationalisation of gas in 2003. The social movements were successful in bringing an end to the neo-liberal regimes that had been privatising and exploiting Bolivia’s natural resources since the 1980s, and in 2005 Evo Morales’ Movimiento Al Socialismo (MAS) party was elected by the support of these movements, on the promises of nationalisation. Supporters of Evo Morales rally during the election. Photo by David Mercado, Reuters. Nine years on, Morales’ government has, without a doubt, improved the lives of many Bolivians through the so-called Proceso de Cambio (process of change). There have been great advances in poverty reduction schemes, with cash transfers to mothers, children, and the elderly, and education reforms that have radically lowered illiteracy rates and medical services, which are now widely available to all and have improved with the cooperation of Cuban medical aid. Infrastructure and industrialisation have also been developed, and an effort towards nationalising Bolivia’s key industries has been central to Morales’ campaign. The new constitution of 2009 is another important achievement for the MAS, implementing new mechanisms of direct democracy and pushing for decentralisation, dispersing authority to regional, departmental, and indigenous territories. The constitution also recognises Bolivia as a plurinational state, as well as acknowledging the rights of Mother Nature, a landmark for the advancement of indigenous rights and environmental legislation. In a country where no less than 30 years ago, indigenous populations were not allowed to enter certain spaces due to racial discrimination, it is not difficult to understand why Morales enjoys extensive support from Bolivia’s predominantly indigenous and low-income population. However, it is nearly impossible to truly break from Latin America’s long history of colonial rule and today’s global neoliberalism, which has meant that the government’s policies have fallen short of the promised revolutionary change Evo was elected on. Indeed, many critics from the left have argued that Morales’ government has focused on superficial policy adjustments driven by populist discourse, without tackling the capitalist structures of exploitation. And to some extent, that seems to be true. The nationalisation of the hydrocarbon industries was, arguably, a simple re-negotiation of contracts with foreign-owned petrol companies aiming to increase state royalties, rather than seizing assets for a full nationalisation. The choice of language in the government’s discourse is problematic when the Bolivian people, who have historically been fierce fighters for the ownership of their resources, are being dissuaded to demand nationalisation any further, as Morales falsely claims the industry is now in the hands of the state. It is not the only issue where the president’s discourse has not been quite in accordance with the reality on the ground. Indeed, Morales is known internationally for his powerful defence of Pachamama, Mother Earth, and claims to represent indigenous struggles for their rights and land worldwide. There is no doubt that Morales’ defense of the environment and his much needed criticisms of growth-driven capitalism are remarkable advances for societies worldwide. The Aymara tradition of Suma Qamaña or buen vivir–the need to live in harmony with nature without focusing on material gains–which has been widely promoted by Morales, reflects an inspiring alternative approach to development. Nevertheless, the discourse is far from the reality of his policies, and one only has to look at the government’s reliance on extractive industries to understand the contradictions. Evo Morales, much like his South American allies in Venezuela and Ecuador, heavily relies on the extraction of gas, oil, and minerals to fund his socialist policies of wealth redistribution, a strategy that can be contradictory to environmental policies and the promotion of indigenous rights. The government has been infamously repressive of the indigenous marches for the protection of the TIPNIS reserve which is under threat by the plans to build a highway linking Bolivian and Brazilian trade routes. Recently, indigenous people in Bolivia have been protesting a mining law that would result in widespread contamination of drinking water and agriculture, resulting in the criminalisation of protests concerning this issue and the closing down of the headquarters of a leading critical indigenous movement, CONAMAQ. Indigenous critics, including Fernando Vargas, one of this year’s presidential candidates, claim that Evo is no different from his predecessors in the destruction of the planet in pursuit of economic growth. This debate sheds a light on the ambiguous incompatibility of socialist and environmental goals. 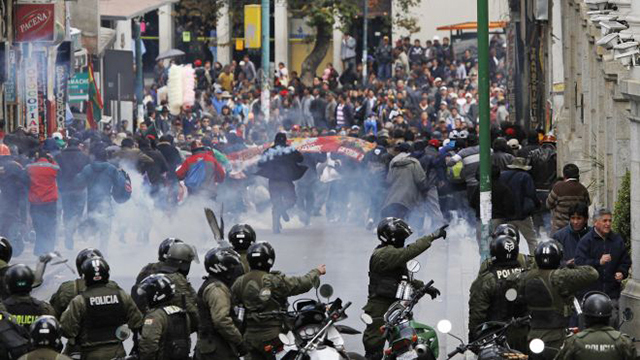 Mostly indigenous miners, teachers, and health workers faced repression from the Morales government during their 2011 strike. The government’s severe repression of the TIPNIS and the CONAMAQ movements illustrates a wider concern about the MAS’ difficult relationship with social movements and critics. Indigenous movements, which have been fighting for their rights for decades, have been accused of working under the influence of imperialist and capitalist groups with the aim to destabilise the government and possibly stage a coup. However, these accusations not only diminish the tremendous work indigenous communities have achieved in their struggles for rights, by portraying them as simple victims of imperialist powers, but also create this unhelpful dualism for social movements: “you are either with us or against us.” Morales’ government, under the intellectual leadership of Vice President Alvaro Garcia Linera, has periodically criminalised any form of criticism, dismantling social movements and accusing critics of working for the opposition. This reality is disappointing, considering it was radically critical social movements that enabled Morales to become president in the first place. Despite all his government’s fallbacks, Evo Morales still represents the hope for change and his policies hold huge potential for Bolivians. His government’s vision of socialist wealth redistribution and Bolivia’s efforts to join the continent’s anti-imperialist tendencies by encouraging regional cooperation is a truly positive step in the right direction. However, as we have seen in Venezuela, the MAS must plan ahead in order to remain strong after Morales’ time comes to an end, to push forward with the Proceso de Cambio. One way to strengthen the government’s position in society would be to change tactics confronting social movements and criticism, recognising that indigenous and worker’s movements should be treated separately from real right-wing opposition efforts to dismantle the government’s policies. The current conflictual strategies will only weaken the MAS in the long turn, losing credibility and support from the left. Enabling safe space for dialogue and cooperation between the government and social movements is essential to stabilise the infant process of de-colonialism and socialism the MAS is trying to establish. Let’s hope the MAS will take the opportunity of this new term to secure their Proceso de Cambio by broadening the debate with social movements and deepening their social project. Claire Veale is a graduate from SOAS (University of London) in Conflicts and International Development; she wrote her Master’s dissertation on Bolivian politics. She has lived and worked in Bolivia on issues of human rights, energy policies and labour protection with CEDLA, a political research centre in La Paz. This article was previously published by Global South Development Magazine.